Sautéed Green Beans and Leeks, Thyme for Cooking simple, for summer. I used flat Italian or Romano beans but any green bean will work. Adding a bit of oil to the butter prevents it from browning or burning. Top and tail bean, cut into 1 1/2" (4cm) lengths. Trim leek. Cut in half the long way and rinse well. Heat butter, oil and paprika in a medium skillet. 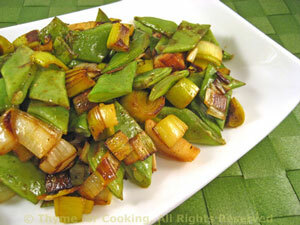 Add beans, leeks and sauté over medium heat until leeks are lightly browned, 8 - 10 minutes.